A scheme to give job hunters free travel goes live today, 1 January. The scheme will offer more than 800,000 jobseekers a month’s free bus travel in England, Scotland and Wales. Bus for Jobs scheme will cover 70 per cent of bus routes and has been hailed by Transport Minister Norman Baker for its “huge role” in giving people access to jobs and training. Greener Journeys – the campaign to promote sustainable travel – has forged a deal with the UK’s leading bus companies to enable jobseekers, especially the young, to use their routes free of charge for a month. The scheme will cover holders of a JobCentre Plus Travel Discount Card, which is available free of charge to eligible job hunters. The distinctive deal – which will cover over 70 per cent of the nation’s bus routes – will give a helping hand to people who are actively hunting for work or training. Bus travel is the most popular mode of transport used by Britain’s commuters, with 5.2 billion bus journeys in the UK each year. The Bus for Jobs scheme will provide free travel on the bus services of participating companies for the month of January and jobseekers who have been unemployed for between three months and one year will be eligible, although the scheme is particularly targeted at young people for whom unemployment rates remain high. Latest government figures show the offer will be available to as many as 817,000 people who are currently out of work and claiming benefits. Thousands have already applied for the cards. Those who are eligible for the JobCentre Plus Travel Discount Card, which is available through JobCentre Plus, include people claiming Jobseekers’ Allowance, Incapacity Benefit, Employment and Support Allowance or Income Support and actively engaged with a Jobcentre Plus adviser in returning to employment. It is being publicised locally by the participating bus companies. Jobcentre Plus staff are actively promoting it to those looking for work and full details of the scheme are available on a specially created website: www.busforus.co.uk. At present, the travel discount card allows users to save up to 50 per cent on train journeys, and on public transport in London. From today (January 1), card holders will be able to travel FREE on many buses around the country. In Britain people make over five billion bus journeys every year. The bus is a big contributor to the success of SME’s and local businesses, as well as large organisations. 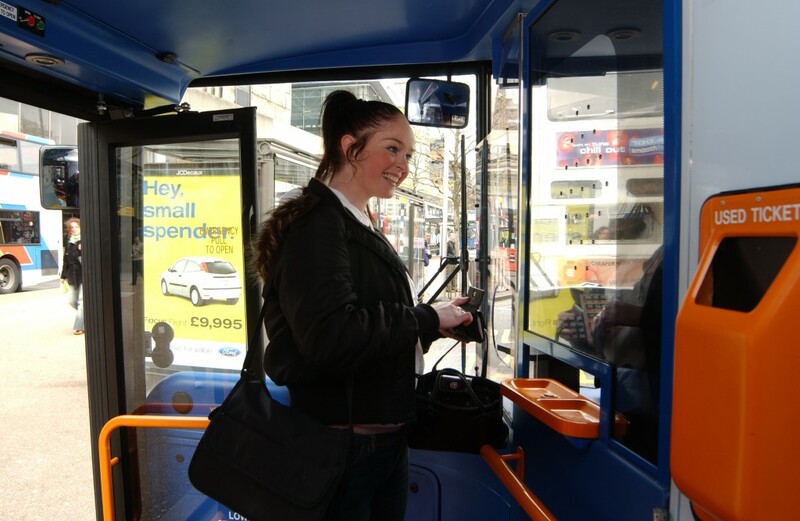 Bus travel can connect people to jobs, to leisure and the high street and to education and training. Greener Journeys hopes this new scheme to help people into work will remind UK businesses and politicians how important reliable bus travel is to many commuters. The initiative runs for the calendar month of January 2013 – Tuesday 1st January to Thursday 31st January inclusive. Greener Journeys estimate the scheme will cover over 70 per cent of all bus routes in England, Scotland and Wales. Buses are an essential mode of transport, accounting for over five billion passenger journeys every year and are used by one fifth of the country’s working population outside London. Nearly three times as many trips are made by bus as by surface rail and underground combined. Moreover, 25% of households do not have access to a car and are completely reliant on the bus for many of their essential journeys. This is not widely known information within the jobcentre or on the bus services. I have been refused entry on the buses even when presenting my discount card & made to pay 4 my journey. I think the incentive is a very good one but pointless if majority of those claiming benfits or jobseekers are unaware of the initiative. I found the scheme a complete success, no problem getting the job centre discount card accepted for free travel outside London. It afforded to travel back to my old University in search of options, advice and inspiration in finding a new job. Something which I would not afford because even a short bus journey of a few stops outside London can cost more £5. I hope the scheme of free ‘bus for jobs’ travel gets established permanently outside London, as it has proved a success for the trial month of January. how do you go about getting this buss pass, they tell you about it but wont tell you how to get it? How do you get the jobseekers bus pass ? HOw can i gat a bus pass. I have started work after being on JSA. How do I apply for a free bus pass. I would like a bus pass. I would like to no how to get a bus pass. hi how can i sign up for free bus travel i am on jsa ? Hi I would like to know how to apply for a free bus & train pass please. I won’t to know if I can apply for an free bus pass to look for work in the west midlands.